The unique properties of graphene can be both a blessing and a curse to researchers, particularly to those at the junction of electronic and optical application. The flexible profiles of these atom-thick sheets have highly mobile electrons, which make them efficient conductors, but generally graphene sheets do not interact efficiently with light. Challenging for shorter wavelength light, photons found in the near infrared region of the spectrum, where telecommunication applications become achievable. 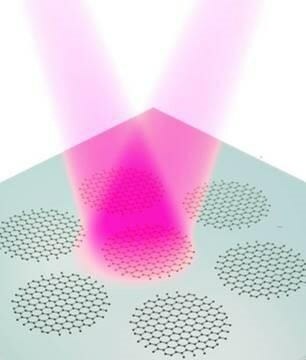 A team of researchers from the Technical University of Denmark have shown, for the first time, efficient absorption improvement at a wavelength of 2 μm by graphene, particularly by the plasmons of nanoscale graphene disks. Their findings have been published in the journal Optics Letters, from The Optical Society (OSA). Similar to water ripples occurring due to the energy of a dropped pebble, electronic oscillations can occur in freely moving conduction electrons by taking in light energy. The collective, coherent motions of these electrons are referred to as plasmons, which also act to intensify the strength of the electric field of the absorbed light at close proximity. Of late, plasmons are becoming quite common in a number of optoelectronic applications where highly conductive metals can be easily incorporated. Graphene plasmons are different compared to plasmons of bulk metals. They face a different set of issues altogether. One of them is the comparatively long wavelength required to excite them. Several efforts drawing on the benefits of the enhancing effects of plasmons on graphene have shown potential, however this is for low energy light. The motivation of our work is to push graphene plasmons to shorter wavelengths in order to integrate graphene plasmon concepts with existing mature technologies. To achieve that, Xiao, Wang and their partners gathered insight from latest developments at the university’s Center of Nanostructured Graphene (CNG), where they showed a self-assembly technique resulting in large arrays of graphene nanostructures. Their technique mainly uses geometry to boost the graphene plasmon effects at shorter wavelengths by minimizing the size of the graphene structures. The team created arrays of graphene nanodisks using lithographic masks prepared by a block copolymer based self-assembly technique. They manipulated the final size of the disks by exposing the array to oxygen plasma. The plasma etched away at the disks, reducing the average diameter to about 18 nm. Compared to the width of a human hair, this is about 1000 times smaller. The array of roughly 18 nm disks, produced from 10 seconds of etching with oxygen plasma, demonstrated a clear resonance with 2μm wavelength light, the shortest wavelength resonance ever seen in graphene plasmons. A hypothesis might be that finer lithographic masks or longer etching times, and smaller disks, would produce much shorter wavelengths. In general this is true, but at 18 nm the disks already begin needing consideration of quantum effects and atomic details. Going forward, the team plan to tweak graphene plasmon resonances at smaller scales using electrical gating techniques, where the local concentration of electrons and electric field profile modify resonances. To further push graphene plasmons to shorter wavelengths, we plan to use electrical gating. Instead of graphene disks, graphene antidots (i.e. graphene sheets with regular holes) will be chosen because it is easy to implement a back-gating technique. There are also elementary restrictions to the physics that prevent reducing the graphene plasmon resonance wavelength with additional etching. “When the wavelength becomes shorter, the interband transition will soon play a key role, leading to broadening of the resonance. Due to weak coupling of light with graphene plasmons and this broadening effect, it will become hard to observe the resonance feature,” Xiao explained. This research is supported by Danish National Research Foundation Center for Nanostructured Graphene (DNRF103).